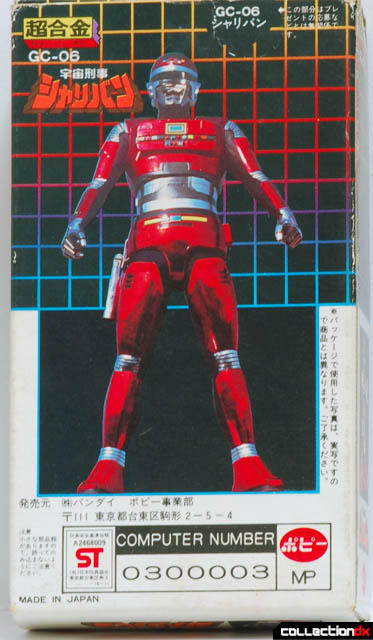 Taken from Wikipedia: "Uchuu Keiji Sharivan (宇宙刑事シャリバン ,Uchu Keiji Shariban), translated in English as Space Sheriff Sharivan, is the second installment in Toei's Metal Heroes franchise which aired on the TV Asahi network from 4 March 1983 through 24 February 1984." The Metal Heroes have always held a special place in my heart, as someone who grew up in the age of live-action Japanese shows first being imported to the US. Mighty Morphin' Power Rangers was awesome, with their fantastic giant robots, but when Big Bad Beetleborgs and Virtual Reality Troopers introduced much more armored heroes, I was hooked. 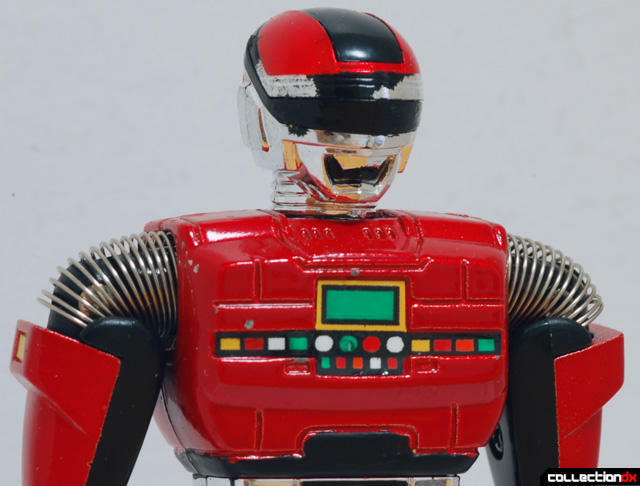 Since finally remembering how awesome VR Troopers was, I’ve been on an information bender learning about all the Metal Heroes. 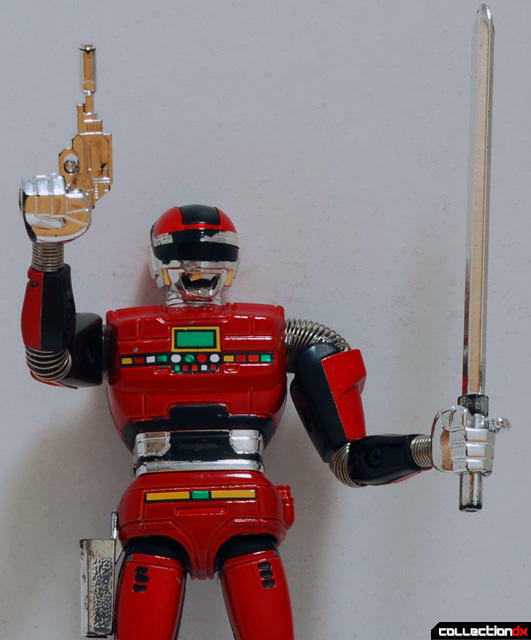 Space Sheriff Sharivan never made it to the States like his brother in-arms Shaider did in VR Troopers (along with Metal Heroes Spielban and Metalder), and it’s a shame because Sharivan clearly has some of the best toys. GC-06 Chogokin Sharivan comes in a gorgeous box measuring 5 1/4" by 3” by 11/4". 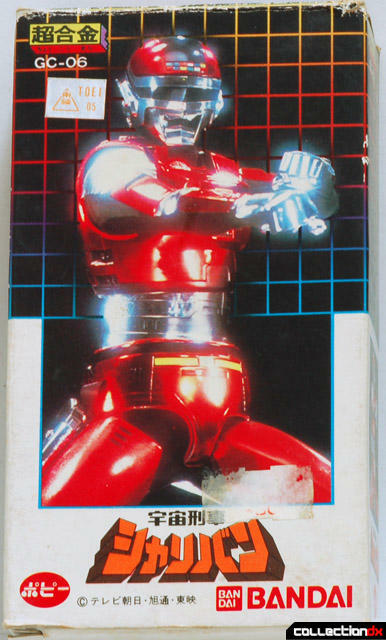 The box is adorned with some stylish 80’s graphics, and what I assume to be a photo of the actor in-costume of Sharivan, with a lovely soft-focus effect that makes all the chrome on the costume POP! My sample also has a Toei licensing sticker on the front, in shiny silver with orange text. The back graphic looks painted to me, and on the back we also see an early COMPUTER NUMBER, very neat, along with the most important words "Made in Japan". Opening the box we are greeted with a wondrous Styrofoam coffin for our hero, and a paper instruction (more like features) sheet showing off the amazing articulation of the figure (more to come on this later). Sharivan comes out of the foam easy enough, and there is a push hole on the back if for some reason you cannot get him out. The accessories sit to the left of the figure and basically just sit in grooves in the foam. The total contents of the box are the foam, figure, instruction sheet, pistol, and sword. Sharivan himself is just about 5” tall on the nose. When we remove Sharivan from his foam packaging, it is immediately noticeable how heavy he is. By my eye, the entire body is metal, along with the armor segments of the arms and legs. The actual joints are all tough black plastic, and the head, hands, weapons, and holster are shiny chromed plastic. 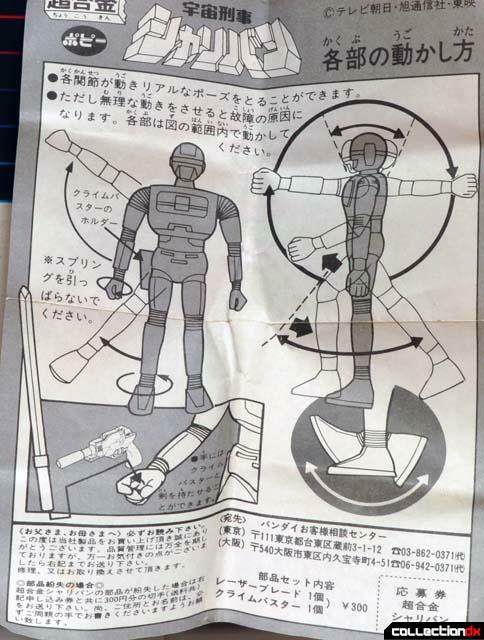 What makes Sharivan really unique is that in order to replicate the pleated material joint covers of the Solar Armor suit, Bandai used wound metal springs to cover the shoulder, elbow, wrist, knee, and ankle joints. This admittedly does block a little articulation in the elbows and knees, but it looks fantastic doing it. Along with the die-cast goodness, the other thing that really sticks out for me with this toy is the amazing articulation. 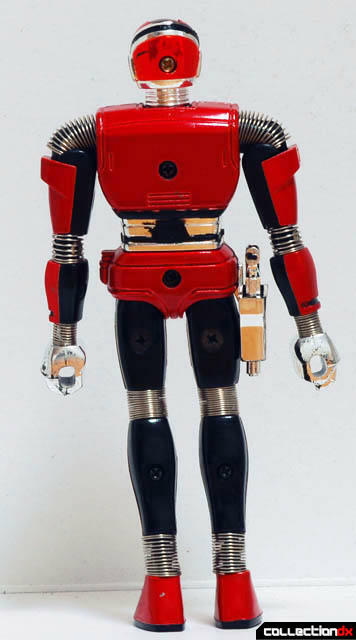 In the early 80s, most toys were still lucky to have any more than shoulder joints… most robot toys like Transformers had just that, barring any joints needed for transformation. In America, kids were stuck with Masters of the Universe and G.I. Joe figures. G.I. Joe 3 3/4" figures are still vaunted for their great poseability for the time, but I’m going to let you in on a little secret: Sharivan's is better. Sharivan features a neck swivel and good head elevation, shoulder swivels and lateral motion, elbow swivels and rotation, wrist swivels, hip swivels and lateral motion, knee swivels and rotation, and ankle swivels and rotation. That’s right, ankle joints! I know many collectors really like the addition of a waist joint to spice up their figures, but I have always felt that ankle joints are far more important, and help figures to stand up and pose well. Sharivan also features a hip-holster for his Crimebuster Handgun, which is also made of chrome plastic and features a bit of motion to prevent it from blocking the side-to-side hip motion. 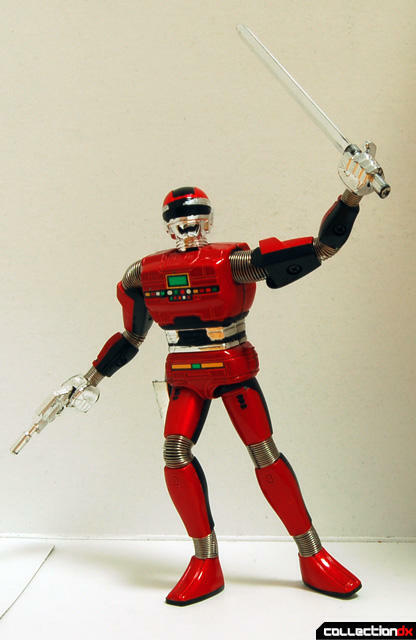 Sharivan's only accessories are his standard-issue Crimebuster Handgun, and his standard-issue Laser Blade. Both fit nicely into the hands; the sword slips in and fits well without being too tight or loose, and the pistol can actually be pushed in so the trigger finger sits in the grip properly. Sharivan looks great using either or both accessories, and can even be posed with a two-handed sword grip (for, you know, keeping the peace). I know that Sharivan is a Space Sheriff, and spends most of his time fighting monsters, but I still think it's awesome that a Sheriff comes with a laser sword; Solar Armored police-brutality at its finest. Sharivan is amazingly dynamic and incredibly fun because of his very well executed articulation. Most figures at the time were lucky to stand up straight, but Sharivan is ready for action, able to take most poses one could think of. Getting Sharivan to stand while doing these great poses is surprisingly manageable: my specimen is nice and tight after all these years, and holds up great. I have handled my figure a lot since I got it, and all the joints feel solid and rugged, and I don’t have any qualms about handling this figure. The ankles do not have any side to side motion to plant Sharivan's feet flat on the ground in any pose, but it’s fairly easy to come up with something good looking with one foot flat on the ground and the other angled for balance. Sharivan lives on my lofted bunk-bed/desk at college, and even with my climbing up the side to get into bed every night he hasn’t fallen over once. From my observations, GC-06 Sharivan can be had for pretty cheap, especially when buying direct from Japan. I’m sure most fans of the show have or want this piece, and I’d highly recommend it to those that don’t. 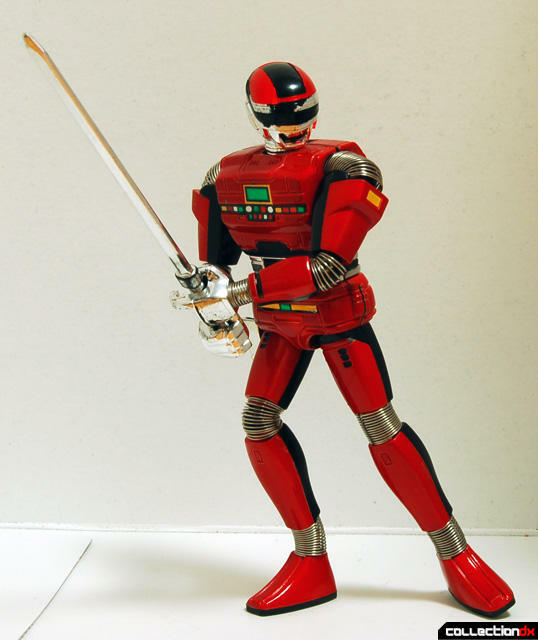 Sharivan's also a great piece to pick up as a wonderful late-run Chogokin piece, as well as an engineering marvel way better than most of its action-figure contemporaries. Pick one up to reenact Sharivan's finest moments of Metal Hero galactic police brutality (and heroism)! Excellent first-review, Ben! And a great piece, too. 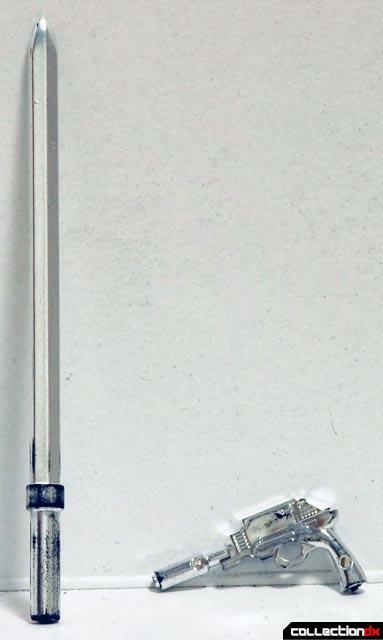 Incidentally, my first CDX review was another Popy GC piece from the 80's: the GC-22 Bismarck DX. Gotta love that high-tech 80's aesthetic sometimes! Hey, thanks! I love that DX Bismarck review... I'd like to get the ST version alot. Did you know... that Andy Warhol did an awesome piece featuring Sharivan? It directly features this toy, GC-06! 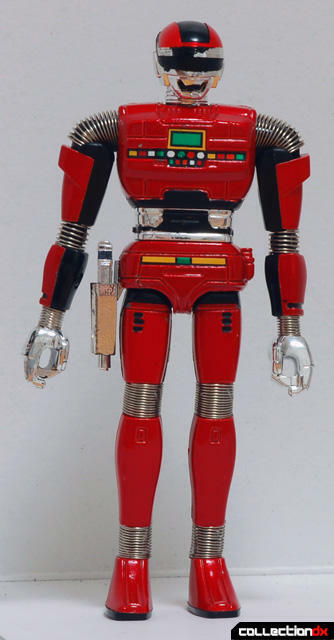 It's from 1983 and called "Flash Sharivan Robot." He also did one of RoboChoi GA-43 around the same time but I'm not sure of the title of the work. if you google image search "warhol sharivan" you will find both pieces easily. This is a great figure, but to say American kids were "stuck" with GI Joe figures really dismisses the fantastic engineering that went into those great 3 3/4 figures. Really the only difference I see in articulation from a GI Joe figure is that the wrists and ankle rotate which is cool but where is the waist rotation? Also high articulation existed with the 60's GI Joe toys and through the 70's with MEGO dolls. This is less an argument of what is more articulated but both lines are great in their own way. 3 3/4 will always be my favorite scale for action figures. I've owned many of these types of figures such as Metal Hero and Super Sentai over the years and still haver a huge collection of Joes. Also many of these toys were available to Americans Kids at places like Pony Toy and local swap meets (USA was getting clearances of Japanese Toys in the 1980s), I owned an equal amount of both American and Japanese toys. Otherwise it's a great review of a fairly obscure piece! Thanks for sharing and looking forward to next review! GI JOE is responsible for a lot of these toys! Nice Leonardo, I love 3 3/4-inch scale for many years and at one time had a ridiculous vintage joe and star wars collection, both complete or near complete, with doubles or triples of most of both lines. I think a lot of japanese collectors don't realize the back and forth japan and the US have done with toys, without which there would be none of these great toys we see here on CDX. 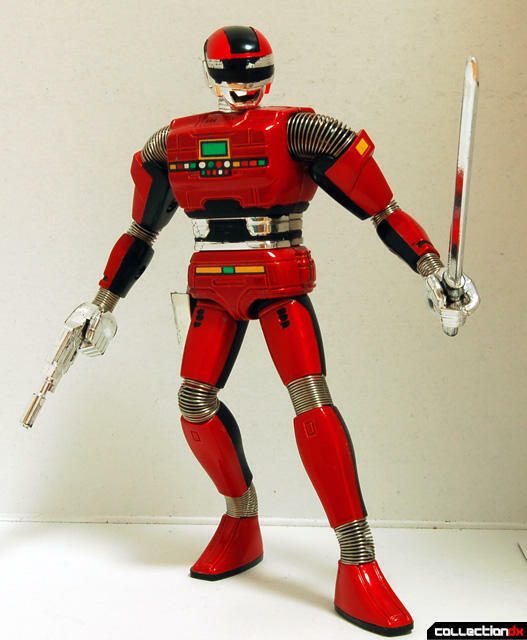 The 1960's GI JOE begat Combat Joe which begat Henshin Cyborg, which begat Microman, which begat Diaclone, which begat Transformers, which begat all the goodness you see before you in the world. First off, great review and thanks for contributing! But it's ironic that it should spark this conversation. 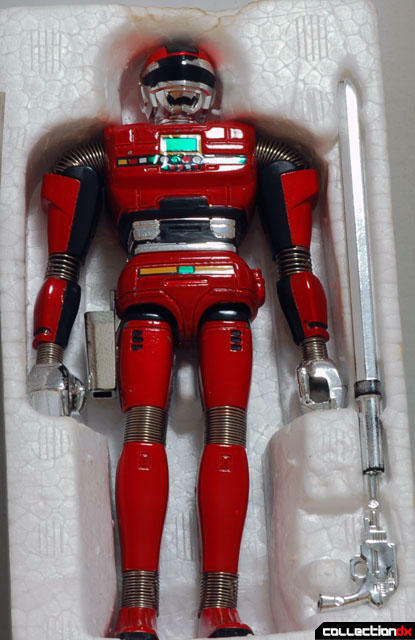 Someone on the CDX MySpace sent a bulletin out a couple weeks back asking what your top 10 favorite toy lines were and it really got me thinking. 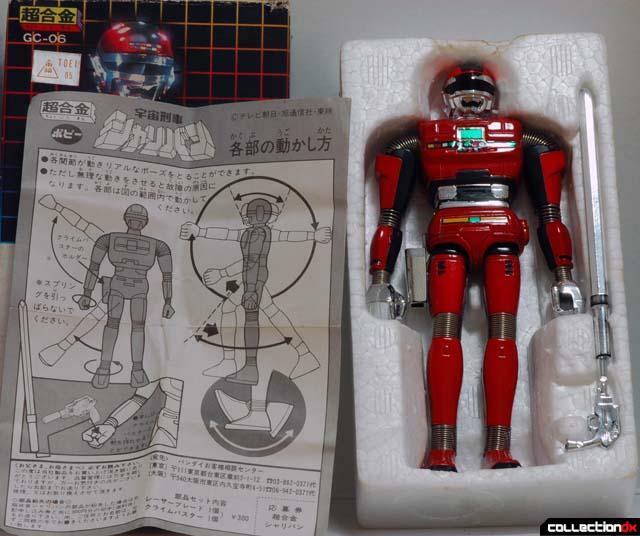 We tend to focus mostly on Japanese toys, and rightly so since they are amazing, but there's a lot, and I mean A LOT, of great American toys that I would collect if money and space were not an issue. In fact, after much deliberation, I actually wrote up a list of my top 10 which I'll probably blog about sometime soon. For the record, both GI Joe and MOTU are in my top 10! It's true that GIJoe is important as both a pivotal US toy line and an influential line abroad, but I could just never get that into it... the closest I came to collecting GIJoes was the Exosquad battlesuit figures. Even then though, the mech figures were way cooler than the pilot figures. I understand and appreciate the 3 3/4" Joes, but I was always more of a 5 and 6" superhero figure fan. I've owned some GIJoe type figures, and while they are fun, they almost never stand up without stands, which bugs me. I still think Sharivan looks more dynamic posed well without a waist joint that GIJoes can with one. As for the stuck comment, I'll admit that as a kid I did not have too much firsthand exposure to GIJoe figures or MOTU... I had a few hand-me-down MOTU figures from a family friend, and they are admittedly really cool. No kid should be disappointed at getting Battle Armor He-Man or Skeletor for sure. Any 3 3/4" O-ring type figure I had as a kid broke. Then the MMPR and Big Bad Beetleborg figures came out... those original sets were amazing, with great accessories and fantastic articulation... I was never as satisfied as a kid with an action figure again until the Marvel Legends line started, and I became obsessed with Iron Man. Guys in metal suits will always beat Army Men for me. I have also seen the Warhol print... it's available on ebay for pretty cheap, and is a pretty slick piece. Thank you for the article prometheum5!!! This is well done. I had no idea how cool this guy was. I just assumed he was a typical, bricky, anonymous sentai character-type gokin. Was I wrong. Those springs are lust inducing. I just had a feeling you didn't like Joe figures and you freely admit that now. That's fine we all have our own taste in what we collect but you just threw around some statements that were historically incorrect about US was so behind in articulation when we very much pioneered it with GI Joe in 1966 and MEGO through the 70's (They both had feet and wrist movement as well as waist movement.). Not only that a Japanese vinyl have very much no articulation and I think they are the coolest ever! There are a lot of toys lines I don't care for, even hate (Rock Lords), but I will give them their proper due and there a lot of figures that I love that I tell people not to buy (read my Saint Seiya Spiral Zone reviews). Being a huge Joe fan, by the 90's GI Joe reached its peak and I'll agree that they were not that great. But that's another conversation for another review! Thanks for the Warhol link! This is a fantastic figure and looking forward to seeing more! Thanks again for the review!